In his fourth attempt to capture a world title, Saint George Groves claimed the vacant WBA Super-middleweight belt following a bruising encounter with Fedor Chudinov, in the chief support to Kell Brook’s similarly bruising liaison with Errol Spence Jnr. under the arc lights of Bramall Lane and 27,000 fight fans. George Groves earned it the hard way. And he really did earn it, fighting through a broken jaw from the 3rd round onwards, against the icy strength and come-forward aggression of his Russian opponent, finally stopping him on his feet in the middle of a brutal 6th round. But George Groves has almost become a specialist in the hard way.As his ring life has been far from easy for more than three years, starting with a challenge for Carl Froch’s IBF and WBA world titles back in November of 2013. When Carl Froch slumped onto his stool at the end of a torrid 6th round for Team Cobra, his breathing of the exasperated words “F*ck me…”, were echoed by everybody watching, for whom anything but a Groves victory was looking increasingly unlikely. It should have been George Groves’ night. From the mental crushing of the Cobra during the months of build-up to standing centre ring glistening with focus before the opening bell, through the pulverising 1st round knockdown of Froch to the inability to miss with his right hand for the bulk of their encounter. Froch began to find a respect for his opponent that had been absent beforehand and as the championship rounds began, so he began to find a foothold. Slivers of inexperience and possibly stamina were beginning to show in Groves. Before Howard Foster made one of the most premature stoppage decisions ever seen in a high-level, world title fight on British soil. The rematch was financially inevitable and athletically essential. Carl Froch fought a rematch full of respect for Groves’ speed, power and ability following a pre-fight build-up of detached calm and nullification built on the foundations of sessions with a sports psychologist as part of his training regimen. Groves again fought well, in a more tactical encounter, and was beginning to enjoy some of his more significant successes when a trap-laid and thunderous right hook ended the fight and his pretentions of taking Froch’s title in the 8th round. Two fights. Two cruel lessons in how difficult it can be to beat a genuine world champion and become one yourself. But both of these fights still go some way to defining George Groves as a fighter because he was clearly winning the first and thoroughly competing in the second against a fighter in Carl Froch, who will be remembered as one of the greatest British boxers of all time and one whose record, particularly between 2008 – 2014 in terms of opponents faced, is very difficult to better. And these were fights following a career foundation that Groves had already built through victories over Kenny Anderson, Paul Smith, James DeGale and Glen Johnson. He bounced back from the second defeat to Carl Froch with tune-up wins over Christopher Rebrasse and Denis Doughlin, to line up his third crack at a world title against the then WBC holder, Badou Jack. On the undercard of Floyd Mayweather’s defence against Andre Berto, Groves hit the MGM Grand canvas hard in the first round from a scything Jack overhand right hand, before regrouping and boxing well in losing a contentious split decision outcome in Las Vegas. And that time spent working things out proved to be the genesis for the ascension of the Saint. He chose to part ways with chief cornerman Paddy Fitzpatrick whose services he had adopted at short notice following a split with Adam Booth during preparations for the first Froch fight. 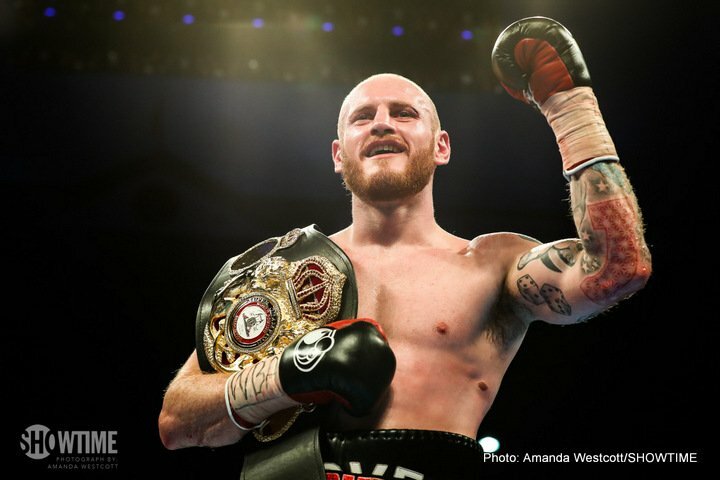 “I am happy and excited to be back and to be joining a new, exciting and dynamic team of young hungry fighters with a fantastic trainer.“ Said Groves, following confirmation that he had appointed Shane McGuigan as his new trainer. A move which has helped to blueprint a sequence of five consecutive victories over increasingly strong opposition, culminating with the Chudinov win and the world championship coronation. So, where next for George Groves? The options are broad and include a lucrative rematch and now unification fight with James DeGale, Callum Smith who meets Anthony Dirrell for the vacant WBC title in September or the unbeaten and back-in-action Mexican, Gilberto Ramirez who holds the WBO belt. In the wider orbit the come-backing Mikkel Kessler has name value, Chris Eubank Jnr. offers some degree of interest and the WBA may be keen to push their regular title holder Tyron Zeuge towards a test with their super champion. Whatever, the ascension of Saint George Groves is complete, as with his driving goal achieved, “It’s a lifetime’s dream achieved. It’s been years in the marking, but it’s finally happened.”only the enhancement of his legacy awaits. Previous boxing news: Adonis Stevenson destroys Andrzej Fonfara in rematch: A real fight next?